Get Comfy and Confident with Cottonelle! This post is sponsored by Cottonelle. Every fashionista has their secrets! Secret beauty products that they swear by, secret tips for getting their favorite brands on sale... and sometimes even bigger secrets. During my freshman year of college at my former school, I lived in a suite with six other girls. One of my suitemates definitely had quite the fashion secret. She always went commando!! (Yes- you know what I mean when I saw commando!) She wasn't shy about telling people why she did it either. She always said that it was the most comfortable thing for her, and that she felt no shame in doing so. I had never met someone before who was so open about doing that, but hey, to each their own, right?! But there is good news for any brave fashionistas who have been waiting for that little extra confidence boost. The new Cottonelle toilet paper with Clean Ripple Texture provides such an amazing clean feeling that it might just make you want to go commando! I have gotten the chance to try out this toilet paper, and it's definitely one of the plushest that I have ever used. Cottonelle with Clean Ripple Texture is available at national retailers nationwide (I picked up mine at my local Target! ), but the best news is that you can get to try out a free sample! Just click here to find out how to get your free sample of Cottonelle with Clean Ripple Texture. 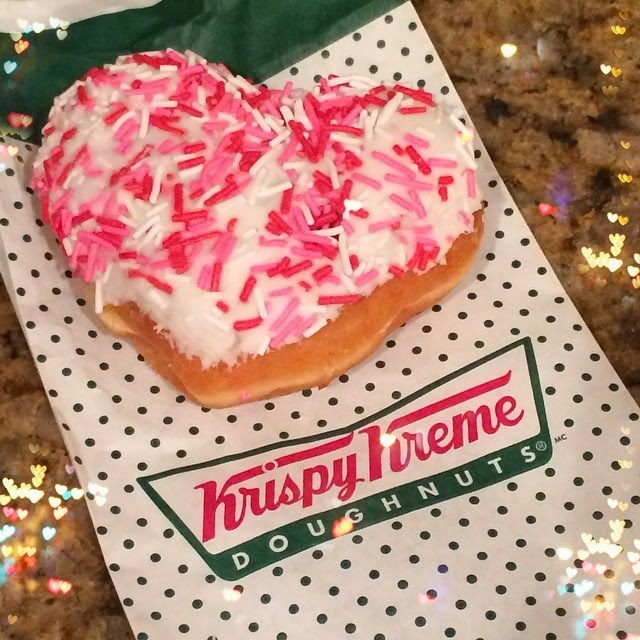 You might love it so much that it will make you want to go commando!! As y'all know, I just love meeting up with other bloggers! There is something so fun about getting to spend some time chatting in person with someone who understands (and actually wants to talk about) things like increasing followers, analytics, blogging networks and sponsored posts! Haha! Morgan is an absolute sweetheart, and I love her blog! Be sure to check out How 2 Wear It to see another great Charlotte-based fashion blog. A lot of fashion bloggers it seems would never be caught dead re-wearing something like this brightly patterned Forever 21 blouse. But you know what? I don't mind breaking the rules! The truth is that I am a college student on a budget, and whenever I buy something for my wardrobe, I make sure that I'm able to wear it in multiple ways. This shirt is such a great example of that! It works very well for getting dressed up with a pair of dress shorts and heels for a GNO (which is still an outfit that I like to wear! ), and for the cooler months it can be easily dressed down and add some color a black outfit with some jeggings and a scarf. 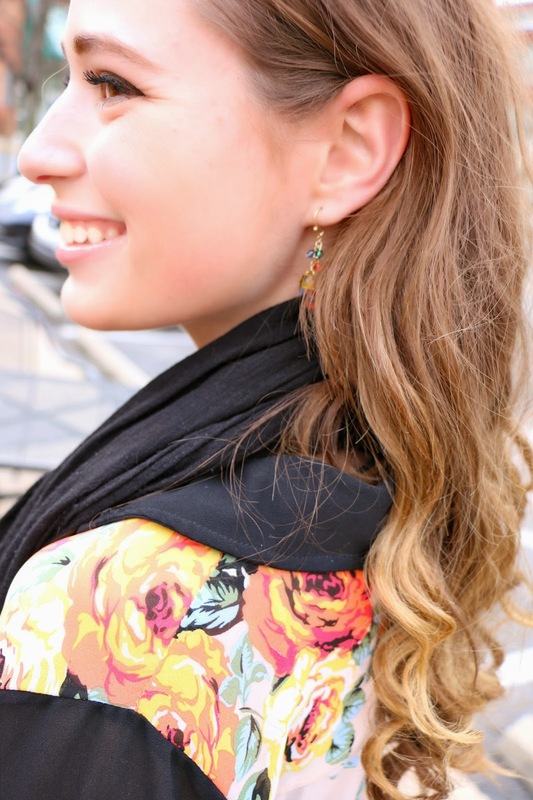 Side note: I just love seeing that my hair has grown out a lot from the last time that I styled this shirt on the blog!! I cut 10 inches off of my hair in mid-April 2013, so almost two years ago now. Finally my length is almost what it was at before the haircut! Definitely not cutting my hair again anytime soon! 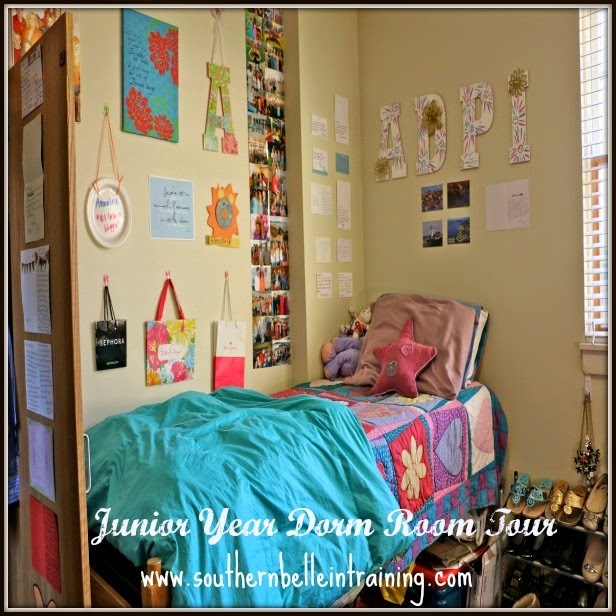 Junior Year Dorm Room Tour! So this is a blog post that has been a very long time coming (considering that I moved into college for junior year at the end of August!). 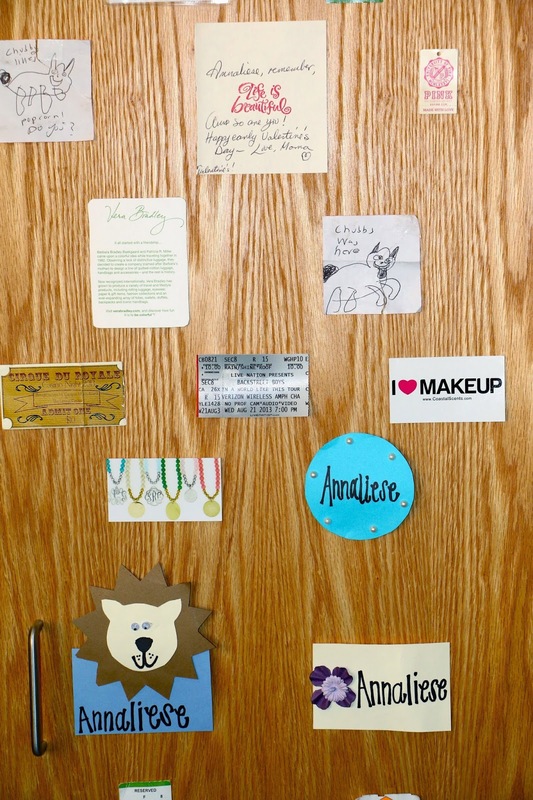 I did a dorm room tour post during my sophomore year (which was my first year at my current college), and it got a lot of positive feedback. I have been excited to show y'all my room for this year, but I have put it off for a few reasons! The first is that I will be honest and say that I'm not exactly a neat freak. ;-) My side of the room is usually pretty messy, so I had to wait until a weekend when I actually cleaned my side to take these pictures. And secondly, although the dorm that I live in this year is nicer than my old dorm in many ways (No more communal bathrooms! Whoo! ), one major downside to my new building is that the lighting is terrible. Both the natural and artificial lighting!! That is why I rarely take pictures for Instagram from inside of my dorm room anymore, and when I do they're highly edited. Anyways, on the afternoon that I did these pictures it was an exceptionally bright afternoon, I had still had to use the flash on my camera for many of them. First up- my "closet!" Another thing that I hate about the building that I currently live in is the fact that we don't get real closets. 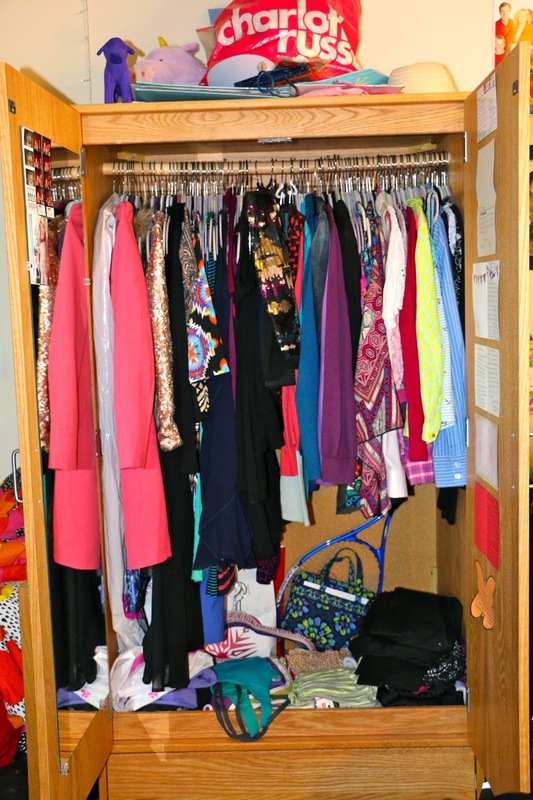 It makes no sense to me- last year I lived in dorm for sophomores, transfer students and exchange students... and we had HUGE closets. 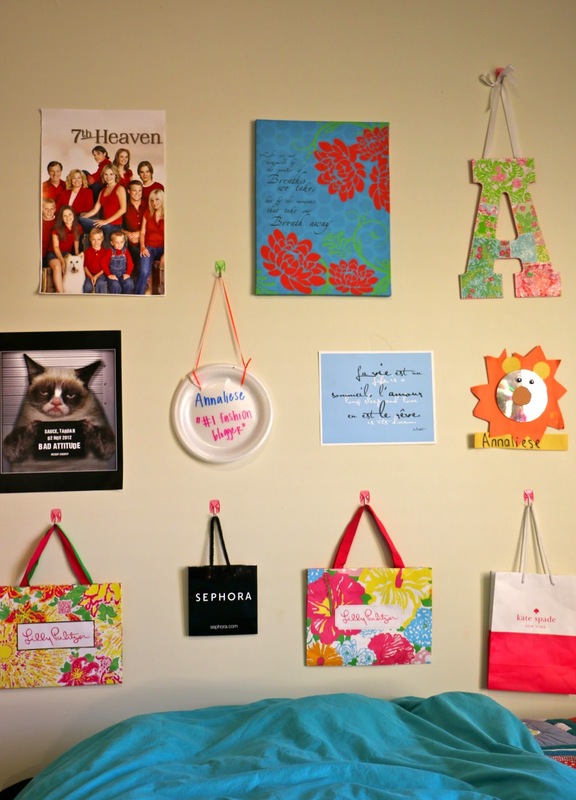 (You can look at last year's dorm room tour post here!) But now that I am living in an upperclass dorm all that we have are these little armoire things which kind of remind of the pieces of furniture which often hold TVs in hotels. Haha! Anyways, mine is absolutely stuffed to the brim! #fashionbloggersprobs. I keep all of my winter coats on command hooks by the front door of our dorm room (which is actually on my roommate's side so won't be shown in the post), and I have about 75% of my summer clothes in a huge Rubbermaid tub underneath my bed. This is my bureau! This is always probably one of the messiest areas of my room- I always try and keep it organized but it just never stays that way. ;-) My TV is on my bureau (since my bed is right across from it), and I keep all of my earrings, bracelets and rings there as well. And vitamins/medicine! Gotta have all that. 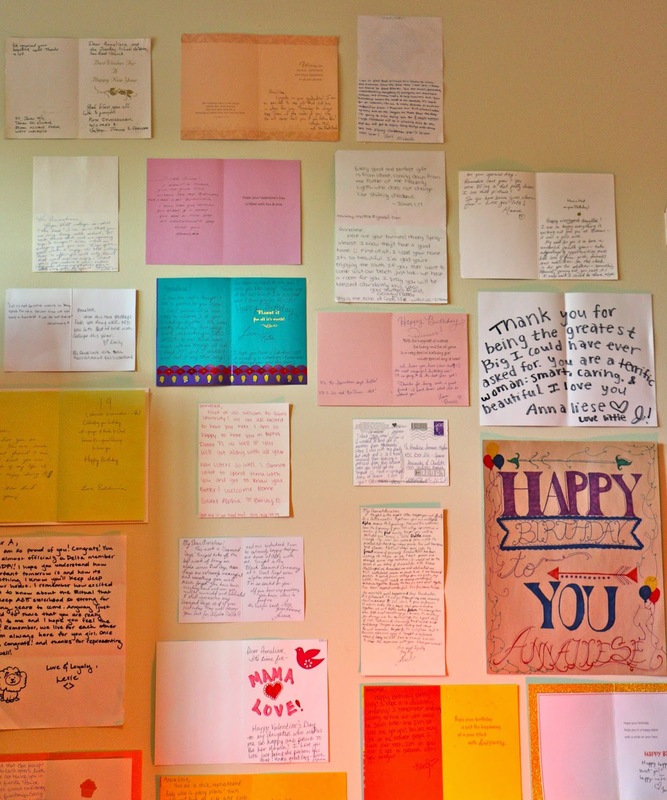 Behind my bureau I hang any cards or letters of encouragement from family, friends and sorority sisters. Some of these notes go back to a few years ago when I was in high school! I love my card wall, and it has gotten so tall that I have had to start hanging cards in other parts of the room. This is the first year that I had a shoe rack, and I have it to be so useful! I can't remember if mine is from Target or Walmart, but I know that both stores (and probably anywhere like Bed Bath and Beyond) sells shoe racks that are this size. I keep all of my necklaces behind the shoe rack on command hooks. They are somewhat organized by color. And here is my bed and my little attempt at a gallery wall! My bed this year is lofted, and it's the first year of college that I've ever had a lofted bed. It took a lot of getting used to at first (during the first few weeks I used to have to do a running jump to get into it), but now I honestly love having an elevated bed. My bedspread is actually the bedding that was in my bedroom at home in Maine when I was little!! And my comforter is Ralph Lauren (my mom found it at TJ Maxx two years ago). This year I tried to make a little gallery wall with various decoration things that I had saved up, and I'm so happy with how it turned out!! It features a couple posters, some shopping bags from my favorite stores, a canvas, and my Lilly Pulitzer painted "A" from an Etsy shop. To the right of it are a bunch of pictures of my friends and family. The bottom of the pictures start at my sophomore year of high school, and the top pictures end this past year at Christmas Break! Not to start off another blog post of mine by talking about the weather... but it was literally in the single digits in Charlotte last night! And not much warmer during the day. The whole week here has been absolutely frigid. We had a "snow day" from school on Tuesday (though it was mostly a day off due to ice I think). As someone who moved to NC for college mainly to escape the frigid winters up North, I am more than ready for some milder weather to come back! And speaking of single digit temperatures, over Christmas break when I was home last, it was definitely cold. The above pictures were taken in 14 degree weather! (I still don't know how I was brave enough to take off my coat and gloves at the beach to make it work for these photos!!) My friend Shara did these pictures for me, and I love her because a.) she is a great friend, b.) she is a great enough photographer so that you cannot tell how freezing cold it was here and c.) she went along with me to the beach on a 14 degree day in the first place! ;-) Good times. The black sweater that I am wearing in this outfit has become one of my favorite sweaters to wear this winter. 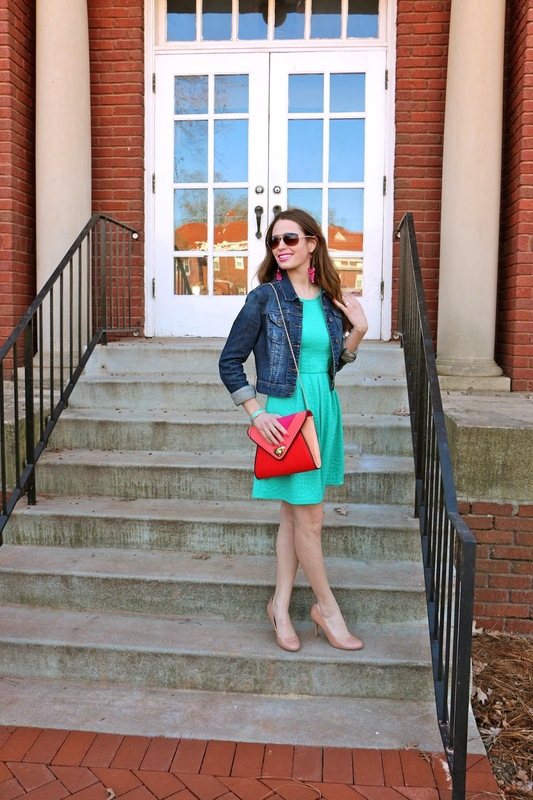 It is from Vestique, which is a favorite Southern boutique of mine (they have two Charlotte locations). It is so comfy and slouchy, but not too casual to that it can't look nice or be worn with some nicer outfit pieces. Vestique is one of my favorite places to visit for really unique tops and sweaters! If you don't live near a Vestique store then you can always shop on their website!! Today the weather in Charlotte is in full-blown winter mode (I'm talking SNOW! ), but just recently, the weather here was a totally different story. 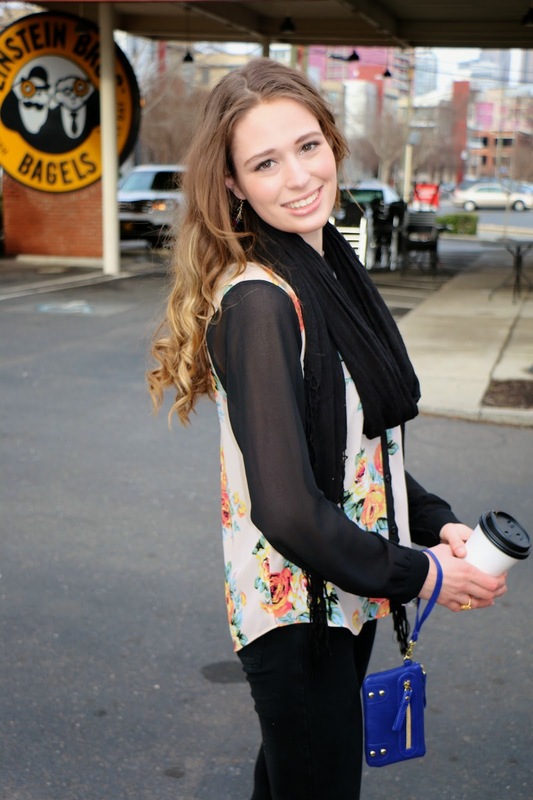 When it was still much warmer a couple weekends ago, Julie (who is my sweet Little in ADPi!) 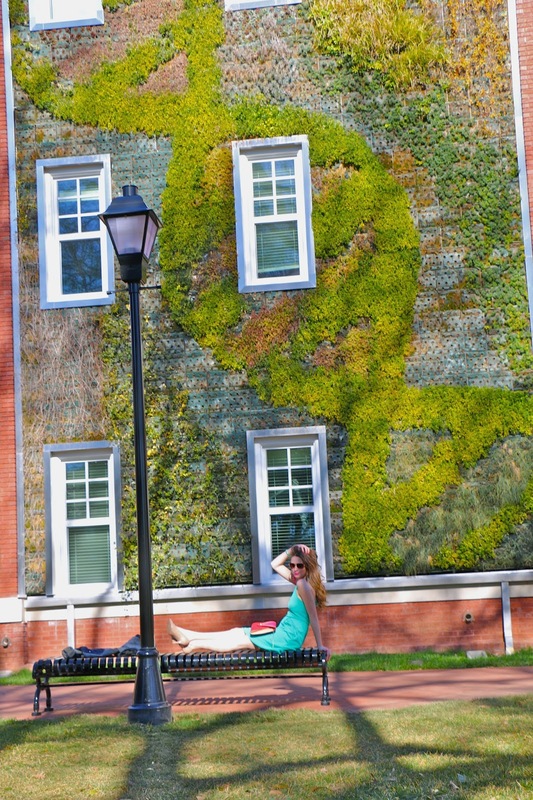 offered to take some blog pictures on our school's beautiful campus for me! 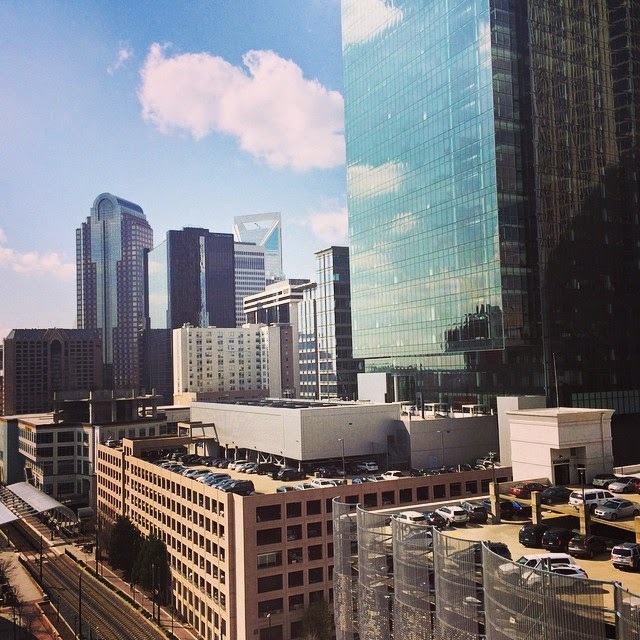 Charlotte happened to be having an absolutely gorgeous weather day, and it was almost 70 degrees! Most of my spring and summer sundresses are still packed away, but I have kept a couple in my closet during the winter months since I know that the weather down here can be very unpredictable. 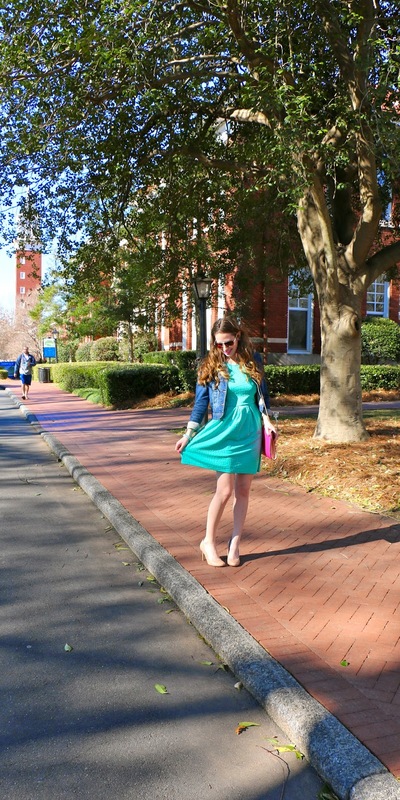 This green dress from Francesca's is one that I left out this year, and I decided to wear it to church that morning! But since the weather stayed warm I kept it on all afternoon. I don't know about y'all- but I always find that I'm much more productive with things like homework, blogging, or any other responsibilities that I have when I am all dressed up! This week sadly the temperatures in Charlotte have dropped steadily, and winter has reminded us that it is very much still here! But I can't complain too much, even though it is a chilly week it is nothing compared to what's going on in my home state! Maine continues to get pounded with snow! I got to Facetime/talk to talk on the phone with two of my best friends from home this past weekend, and they both told me that they can't even remember seeing a winter with this much of a a snow accumulation. 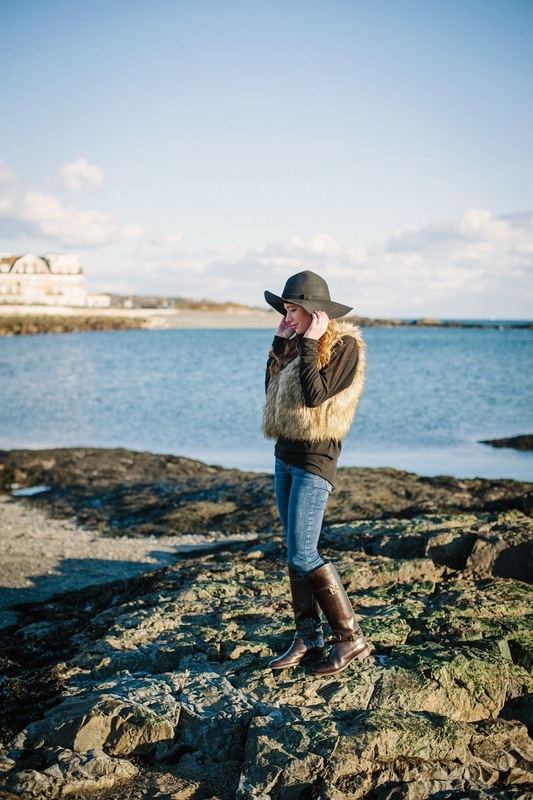 In honor of the cold, I will be sharing a belated winter break OOTD from my last trip home on the blog later this week (with pictures taken by my friend Shara of Shara Lynn Photography!, so be sure to stay tuned for that! 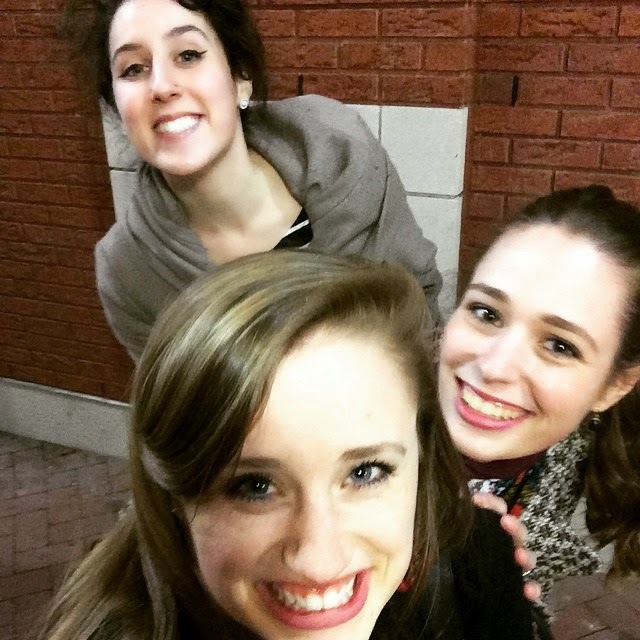 It seems like it's been forever since I've done a life-via-Instagram post! So I figured I would kick off this week with letting y'all know what I have been up to lately (besides just planning my blog's big rebranding of course!). I've never really been big on the whole #WCW trend, but I did post one on my Instagram a couple weeks ago!! These three ladies have been such a big blessing to me this year, and they deserved a special shout-out. 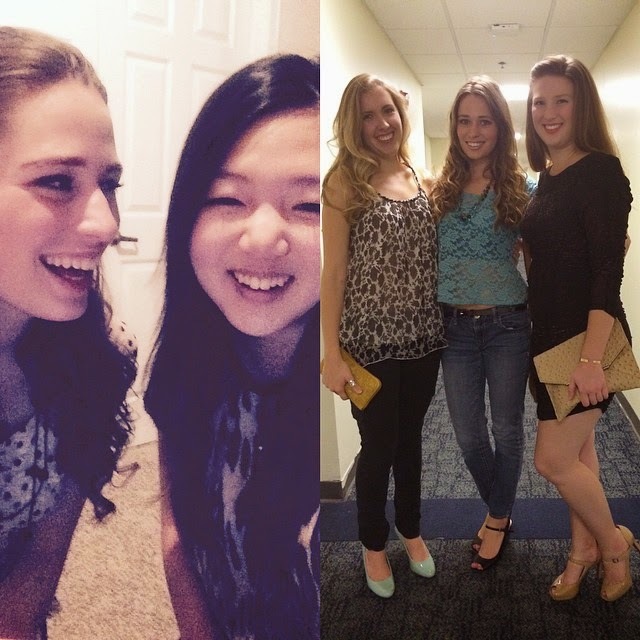 In the photo on the left is my friend Soo Jin, my sweet friend who I met through my classes (we are the same major!). 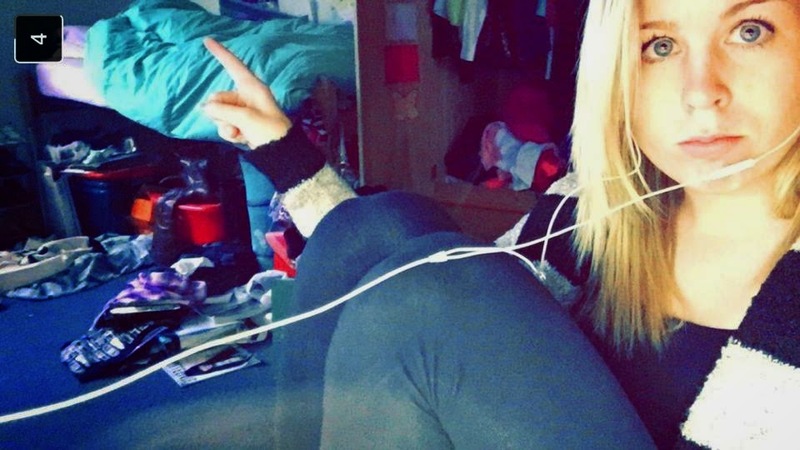 She is on the golf team here at school, and is the reason of how I met my amazing new roommate! Soo Jin is one of the sweetest and funniest girls that I know at school. In the picture on the right are Caroline (who has been on my blog before!) and Lily. I knew both of these girls last year, but we have become so much closer this year! These two girls are the type of ladies who are going places!! I am honored to call them both friends. All three of these girls are sweet sisters in Christ, and I am so thankful to have found more friends at school this year who encourage my faith! 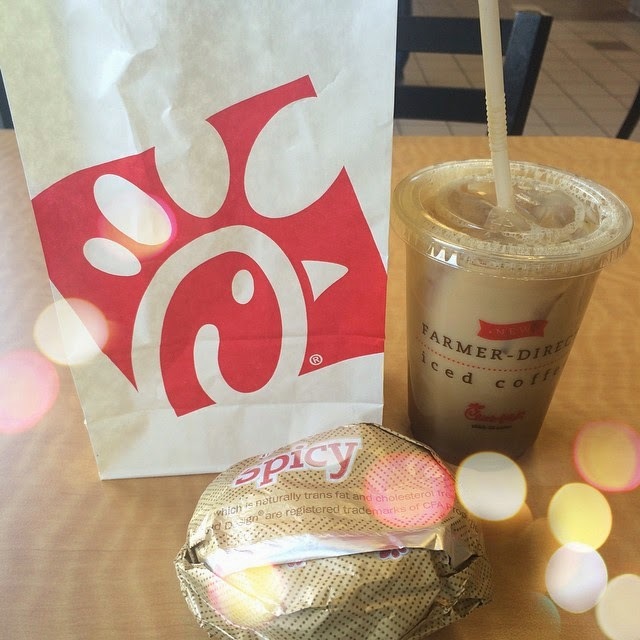 I seemed to have forgotten how amazing Chick Fil A breakfast is! To make-up for the fact that I hadn't had it in forever.... I had it twice last week. :-) Also- I recently discovered that I LOVE Chick Fil A's vanilla iced coffees! So weird considering I hate just about anything that tastes or smells like coffee... but I cannot get enough of the ones from there! I had to go into Uptown Charlotte this past Thursday afternoon, and discovered a new parking garage in a side of Uptown that I hadn't spent as much time in before! Y'all know that I love doing my blog photoshoots in parking garages, and this is definitely one that I might return to- just look at that view! 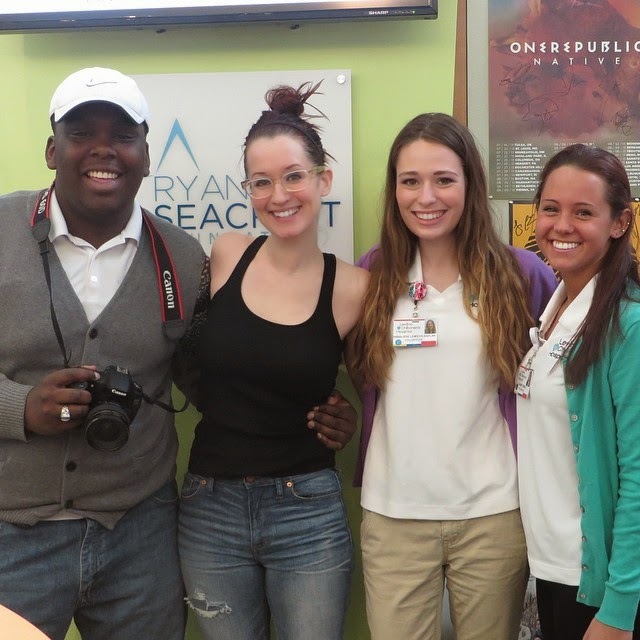 An update from my internship: singer Ingrid Michaelson came to visit and do a live performance a couple weeks ago! She is probably one of the most down to earth guests that I've gotten to meet through my internship so far. So much fun to meet her! 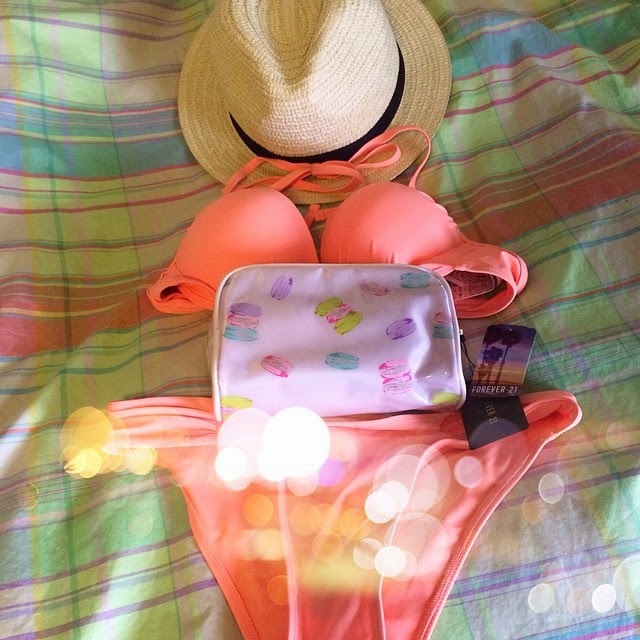 And lastly- one picture not from my Instagram! I briefly mentioned above that my friend Soo Jin introduced me to the girl who is now my roommate. I do indeed have a new roommate this semester, and she is pretty much the greatest ever. We are complete opposites in just about every way, but she is so much fun to live with!! Mia and I do not have any pictures together yet... except for this one... she took a selfie while I was power napping between classes one afternoon and sent it to me- I can't even look at it without laughing! The New and Improved Southern Belle in Training! The big day is finally here! Today is not only Valentine's Day, but also the day that I am launching the re-brand of SouthernBelleinTraining.com! My new blog design/vision for my blog has been in the works since mid-December. My blog designer was the incredible Gina Alyse, who is not only a talented graphic designer but is also one of my blogging besties (who I have also gotten the chance to hang out with in real life a couple of times!). Gina did a perfect job of capturing how my style and attitude towards blogging has changed since I had my former design done.... and she did this all so patiently and creatively! 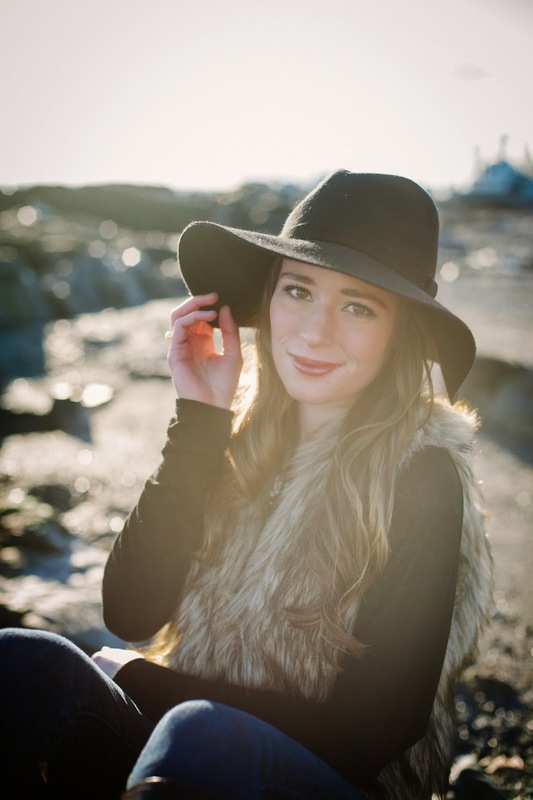 I would HIGHLY recommend working with Gina for any of your blog design needs- not just because she is super talented at what she does but because she is also a wonderful person! 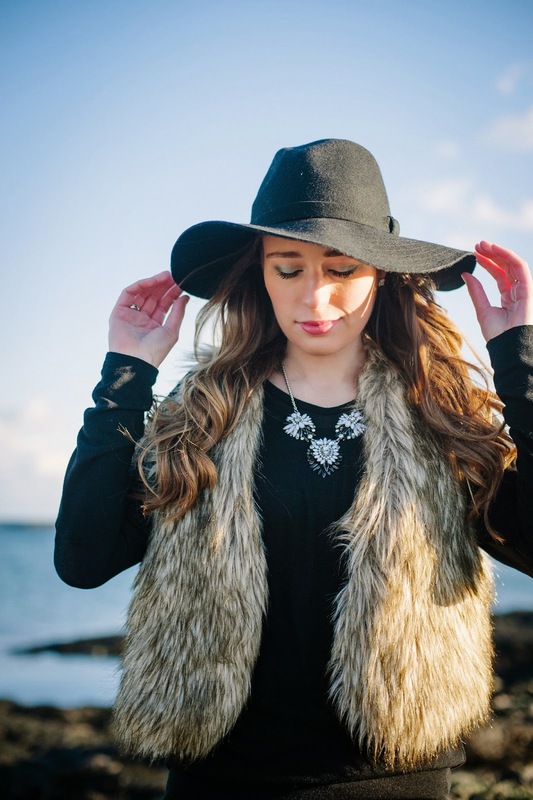 During the past year and a half my blog has become predominantly fashion focused. I have realized that fashion blogging is a true passion of mine, and such a great way to express the love of fashion and dressing up that I have always had. But I want to make my fashion blog different from the rest. 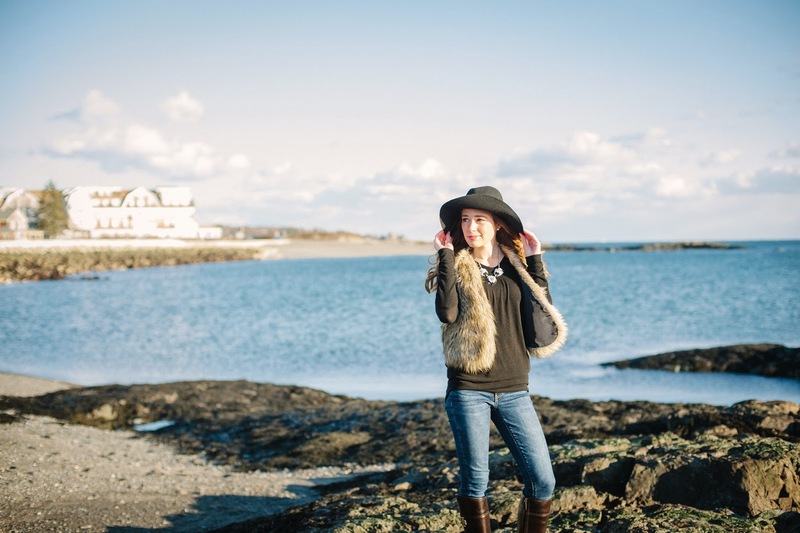 There are tons upon tons of other fashion blogs out there, and while it's great to see so many other girls disocovering the same amazing hobby, many fashion blogs have a feel to them that is too similar. I never want the content on my blog to feel too "cookie-cutter" or impersonal. What I want to be doing is providing you all with a look at my own personal outfits that are affordable, classy and colorful (although ironically not colorful in the case of the outfit that I'm wearing in these photos ;-) ). 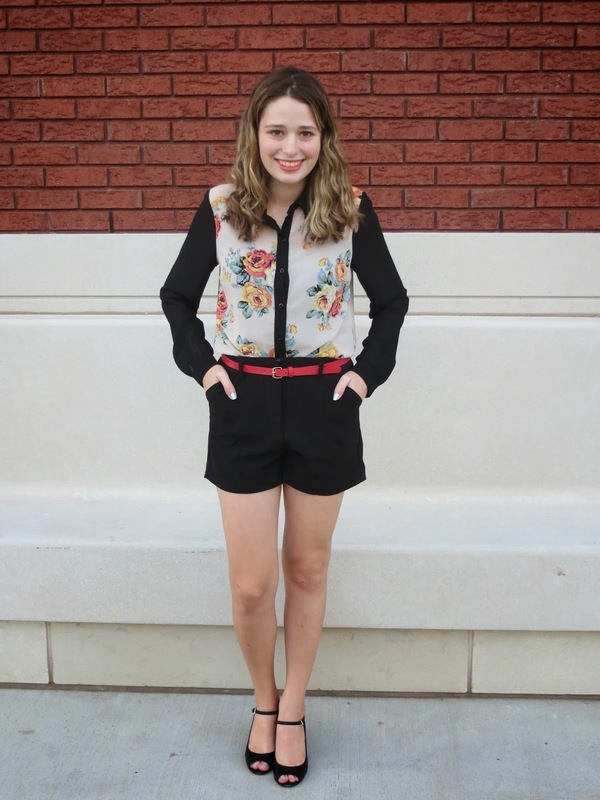 Hopefully my outfits are especially inspiring to fellow college girls, but I would hope that anyone reading my blog would be encouraged by my posts and can see that you can look great while staying on a budget (and splurging occasionally as well!). I still plan to include some lifestyle content on the blog as well- hopefully about once a week! I always have enjoyed sharing recipes that I have enjoyed making or songs and playlists that I am loving listening too. One thing though that I am discontinuing is sharing monthly goals and beauty favorites. This is something that I kept up with for almost all of 2014, and it just got too stressful! I will now only be sharing these things if I ever feel it's needed. And lastly, I will absolutely still be blogging about my faith from time to time as well. My greatest hope is that someone, somewhere, might someday find my blog because of fashion and lifestyle content, but end up being encouraged or spoken to by the Lord after reading something faith related on here. So that is the plan! Are you on board?! 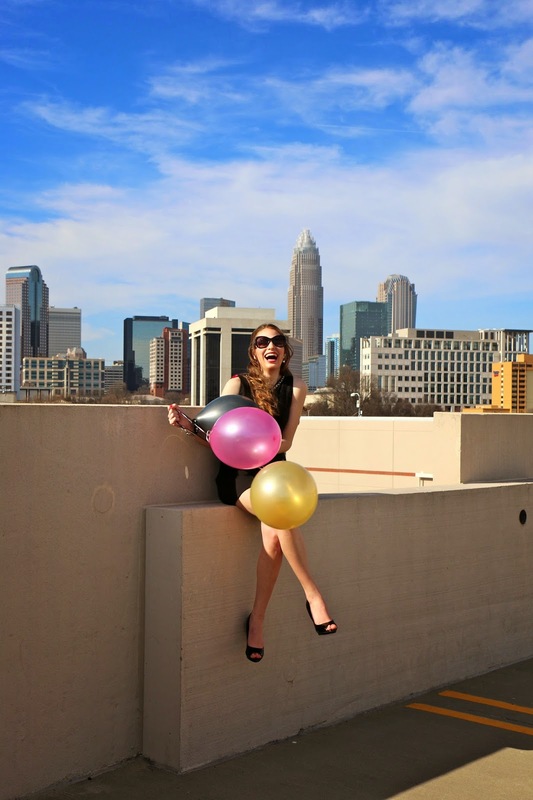 :-) Of course to celebrate the new blog design I had to do a photoshoot in my favorite place to shoot in Charlotte! BE HERE - February 14th. Best in Blog Photo Bloopers: Winter 2015. Style Theory Tour Charlotte: Recap.